Opening Reception - Saturday, May 8th @ 7:30 p.m. Featuring Jose Arenas, Carlos Castro, Emael, Chris Granillo, Erika Hannes, Hector Dio Mendoza, Johanna Poethig, Lady Reni, Joshua Short, Jose Antonio Suarez, Robert Trujillo, Christina Velazquez, Rio Yanez, and Marilyn Yu. Mad World: Messages to the Future, an exhibition featuring work by fourteen artists’ that imagine the future in 40 years through a fictional history of objects. In considering work for the exhibition, artists’ were asked ponder the statement, ‘If you’re interested in the future, Invent it.” Responses range from both the artistic representation of objects 40 years from now, to witty and thoughtful statements about our cultural evolution. Through works such as future almanac entries, nomad friendly furniture and functional objects made from discarded material, the exhibition will display a unique imagining of what’s to come. Last year, Galería organized an exhibition entitled Strange Hope in response to the ambivalent feelings of expectation and despair brought on by the inauguration of the Obama era and the simultaneous downfall of the economy. One year later, with the world in worse shape than ever before, we invited artists to think beyond the troubling times and instead summon a creative visioning of the future. 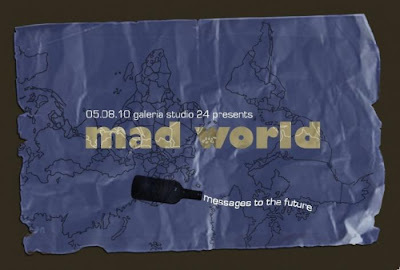 Mad World: Messages to the Future paves the way for Galería’s 40th anniversary season. The exhibition will include an interactive component in which the public will be invited to share their thoughts, desires, and aspirations of Galería in 40 years. Entries will be included in a catalog as a ‘time capsule,’ which will then be preserved in Galería’s archive at the California Ethnic and Multicultural Archives at UC Santa Barbara.